Is this any way to run the largest proposed copper mine in the world? A private contractor working for the Army Corps of Engineers is seeking cost estimates on the Pebble Mine to evaluate whether adjustments to the mine plan are economically feasible. The Clean Water Act requires the Corps to identify the “least environmentally damaging practicable alternative” before issuing a dredge and fill permit, and an environmental group says the company should provide the financial data. But Northern Dynasty Minerals Ltd., the Canadian company based in Vancouver that owns the mine, said in a written response to a Sept. 5 request for information that it couldn’t give cost estimates to the contractor for the mine’s exploration, permitting, development, and construction. For more on this, see “Pebble Mine and the Art of the Shell Game,” at NRDC’s website. As the cash-starved Canadian company Northern Dynasty Minerals (“Pebble”) continues to search for elusive funding for its widely condemned Pebble Mine, the federal permitting agency reviewing the project—the U.S. Army Corps of Engineers—has claimed publicly that it isn’t concerned with the company’s troubled finances and doesn’t need to see an economic analysis of the project’s feasibility. Now, two recently revealed “request for information” documents (RFI 70 and RFI 59) from the agency’s contractor AECOM to Pebble establish that, behind the scenes, the agency has, on at least two occasions, explicitly asked Pebble for information on “estimated costs” and “cost/feasibility” and been told that the company can’t provide it. Why can’t it be provided? An updated estimate to complete the project cannot be provided at this time due to National Instrument 43-101 reporting requirements . . . .
As the work completed contains data and information that is directly relevant to the overall economic analysis of the proposed project, PLP is not able to share it at this time due to the associated reporting requirements. As described on Wikipedia, it is a Canadian securities regulation whose purpose is to ensure that “misleading, erroneous or fraudulent information relating to mineral properties is not published or promoted to investors on the stock exchanges overseen by the Canadian Securities Authority.” By citing it, Pebble is suggesting that, were it to provide the requested economic analysis for the project under review by the Army Corps, it would be vulnerable to a charge of violating National Instrument 43-101. Pebble offers a cost estimate of $5.5 billion and refers the agency to a 2011 economic analysis (called the “Wardrop Report”) that the company has previously said—but notably now neglects to mention — is “out of date such that it can no longer be relied upon.” Presumably, the 2011 report “can no longer be relied upon” because it doesn’t actually address the economic feasibility of the smaller project proposed in the pending federal permit application; rather, it analyzes the full mine build-out scenario being promoted in 2011. Apart from the dismaying disingenuousness of Pebble’s response, economic feasibility matters because the Army Corp’s fundamental alternatives review depends, among other things, on the capacity of an applicant to support the project financially through design, construction, operation (including mitigation), and long-term management. An economically infeasible alternative is, at best, a waste of everyone’s time and, at worst, an environmental and social disaster when something goes badly wrong at the mine. The Pebble Mine has already been abandoned by four major mining companies, including three of the largest in the world: Mitsubishi in 2011, Anglo American in 2013, Rio Tinto in 2014, and First Quantum Minerals in 2018. The people of Bristol Bay are committed never to relent in their overwhelming opposition, and the project has become an international pariah. 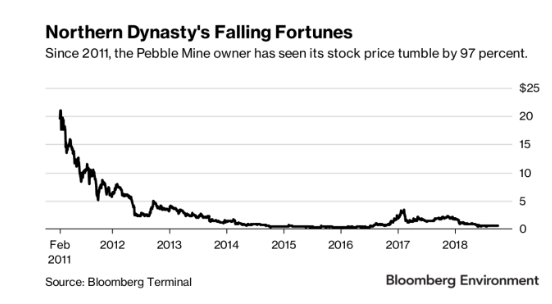 Northern Dynasty is, once again, all that remains, looking for investors, doing whatever it can, as fast as it can, to get a permit from the Army Corps without the basic economic and technical information that any credible mining company would insist on. The Army Corps should insist on it, too.